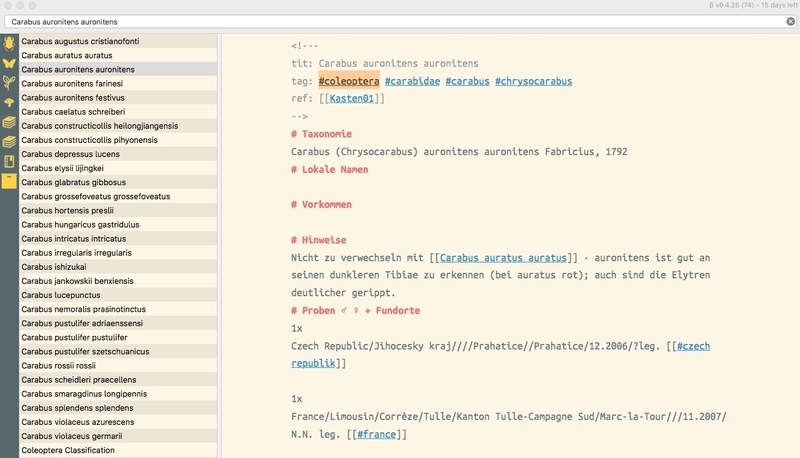 I started to integrate my entomological database (before I used a custom made highly complex FileMaker DB) into my Zettelkasten running with The Arcive. And man, it works great! From time to time my previous FileMaker solution has given me strange problems, since the database began to grow. So I started to search for a stable and reliable solution. I know, that many entomologists work with Excel sheets, which for me is much too inconvenient. Most museums use database programs. Many years ago there where different special database solutions available on the net, but meanwhile you can't find them anymore (only a solution for MSACCESS (I don’t use Windows) and another one for FileMaker). I was tired to rely on complex but fragile solutions. I need a workhorse, simple and strong! So I thought - maybe I can do it with .txt files only. And yes, it works great! What do we need for an entomological data collection? 7.) Ability to add data for detailed event decriptions, detailed locality descriptions, loan data, literature data etc. etc. Everything can be done with simple .txt files. The main advantage is the beautiful simplicity and the speed - you can search and find data much faster than using a complex database program. You can store everything in one folder on your harddrive, and each file represents one specific datum (with database programs everything is hidden encrypted somewhere inside your program). If you really want to break everything down to taxonomical steps, you can do so. What only means: much more files. I decided to use tags - so e.g. that's it. Everything will be available, regardless if you need subfamily, tribus, subtribus or what ever status in addition. P.S. : As you can see, I also use TA for botanical data (interlinked with the coleoptera data) as well as for lepidoptera data. Is The Archive software now available? I thought about taxanomy a couple of years ago as a use case for the ZKM but never never elaborated on that thought further. @raluke Not yet. To keep up to date subscribe to the newsletter. TA provides (.. cough ...nearly* ... cough..) everything you need to run a complete entomological data management - that's really, really wonderful! I can remember some years ago a company sold a relational database software for museuems and entomologists for hundreds and hundreds of Euros - the truth is, such a complex system is abolutely not neccessary. Textfiles and a program like TA will do it for you. 4) security: the structure is simple and rock solid, even when your program crashes it won't affect your data. *Nearly? The only thing I miss (a bit): whether an integrated markdown preview as we know it from nvALT or inline view for images. Can you tell us about the biggest challenges you had? One example you mentioned is the right ratio of files to tags. This is true for any application of the plain text approach. PS: Image preview will definetely come. 1) Each taxon has one Zettel. No ID needed, cos the Taxon IS unique. 4) Zettel provides data for valid taxon/synonyms/description/distribution/hosts/specimens/storage/images/literature - but you can add whatever you need. 5) From each datum you can link to a corresponding Zettel - e.g. if you have more detailed data for a certain collection event (of which your taxon datum is part of); link to a hostplant (botanical Zettel); link to the collection drawer, which hosts your specimen (that's handy - one click and you have the exact overview what is in your drawer) etc. p.p. 6) If you have specimens which are not idetified yet (or the determination is uncertain) - just add a prefix to your Zettel title to make sure, that this is material which needs to be worked on later. Image preview will come - wow - that's great news! @ChrisJohnson This is really great. I was just researching today for a better (simpler) contact management solution, or as some like to call it customer relationship management system. Basically all you need are basic contact details: Name, Company Name, Title, Phone Number, Email, Address, etc. The other thing that is useful is to link multiple contacts to the same Company. That way, if you want to reach someone at Microsoft, for example, you can easily find all the people you have in your database who work there. There are so many complex software related to CRM that it is overwhelming and unnecessary. I've been playing with the idea of using a basic txt file system to manage this. I'm still playing with this concept but you have alluded to some of the possibilities of database management in the Archive!